These Cheesy Quinoa Quesadillas are super easy to make. Plus, they are perfectly crisp and amazingly cheesy. An absolute must for those busy weeknights! 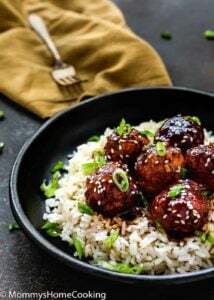 I feel like a lot of time has passed since I shared a recipe, but it wasn’t that long ago! That happens when you really enjoy what you do. These past days I was working on the special photography project I mentioned before. I loved it. It was intense though. I had to do the whole process, from planning the recipe, cooking, shooting and editing. My family was happy since they enjoyed an early Thanksgiving feast, from Citrus-Aji Amarillo (Peruvian yellow pepper) Turkey to everything pumpkin, including a pumpkin alfajores to die for. Take a peek here. But coming back to our present times I realized that two big Mexican celebrations are around the corner: El Día del Niño (Children’s Day) and Cinco de Mayo. So I decided to share with you these super delicious and Cheesy Quinoa Quesadillas!! 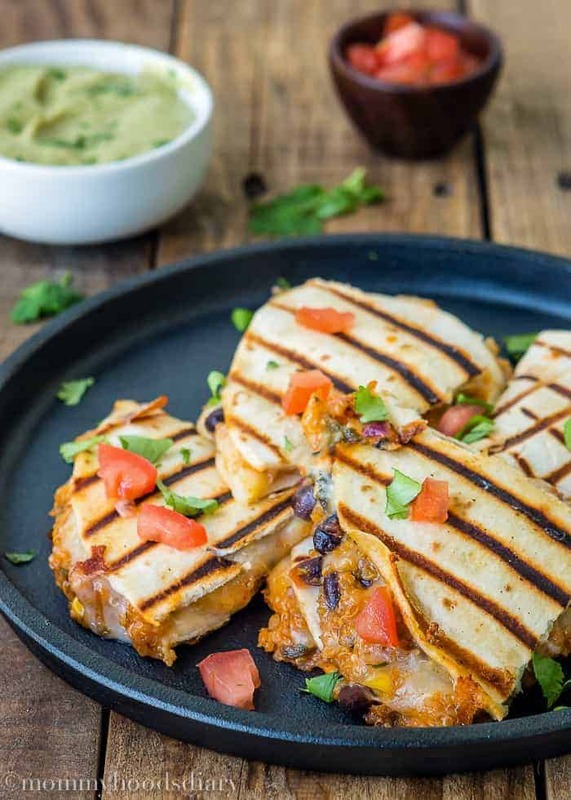 To make the filling of these succulent quesadillas I used Herdez® products! I loved the big glass bottle. It’s pretty convenient, in my opinion, since I can use exactly the amount I need and store the rest in the refrigerator. They offer a wide array of great products so take a minute and check them out. As you may, or may not know, I always try to camouflage quinoa, or any other nutritious ingredient, in salads, casseroles, or whatever. 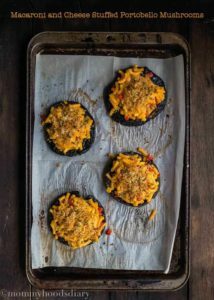 I have to confess that I don’t get as excited about these “healthy” recipes as I do with any dessert, but I recognize the importance of making healthy changes in our life. I really really really hope I didn’t ruin the “healthy” aspect of this recipe adding so much cheese. I mean… they have quinoa and beans, and they are meatless so they’re still “healthy”, right? I ♡ to drown my quesadillas in a pool of yummy sauce, and Guasacaca sauce sounded perfect!! 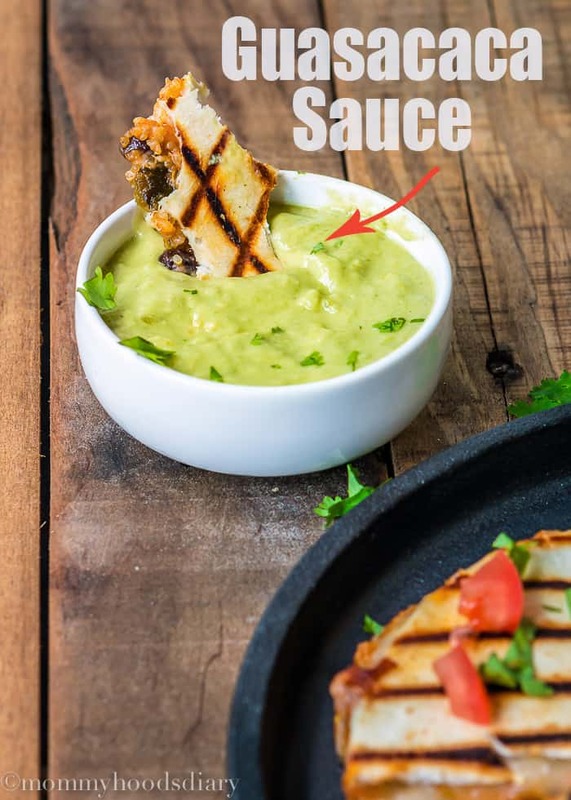 If you are not familiar Guasacaca is a Venezuelan sauce made of avocados. It is compatible with, I mean, literally, everything … believe me everything!!! I always have a jar in my refrigerator ready to eat. Find recipe here. These Cheesy Quinoa Quesadillas are super easy to make, no-fuss. Plus, they are perfectly crisp and amazingly cheesy. An absolute must for any celebration coming up or just for those busy weeknights! 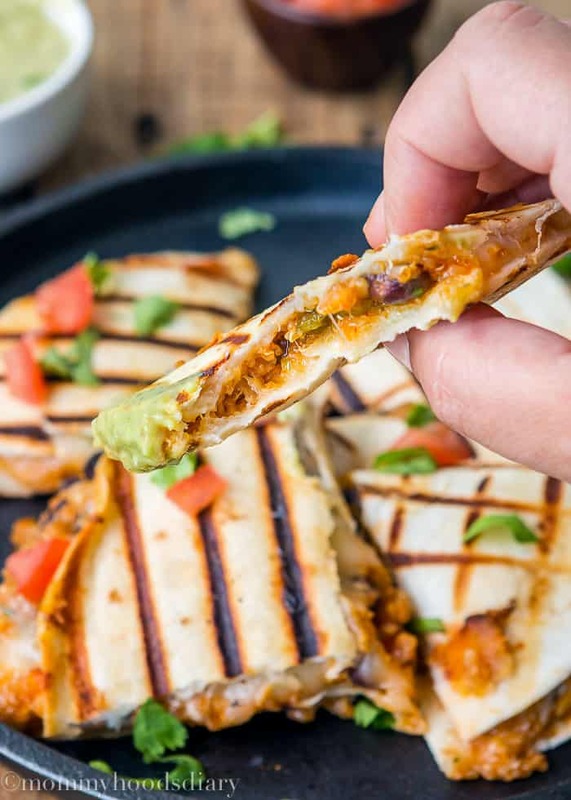 It’s simply quesadilla heaven. 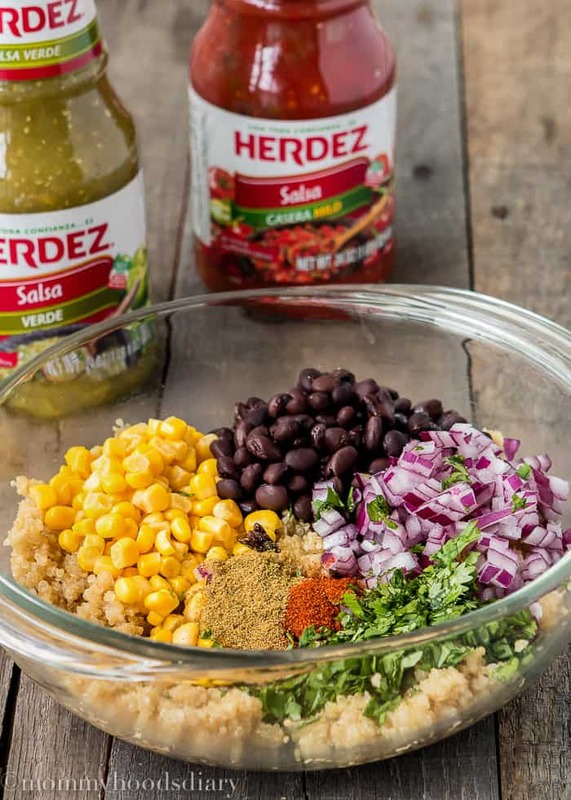 In a large bowl, combine quinoa, enchilada sauce, salsa verde, corn, black beans, onion, cumin, cayenne pepper, and cilantro; season with salt and pepper, to taste if necessary. Stir in 4 cheese Mexican and mix to incorporate. Preheat a griddle over medium heat. Brush one side of tortillas with butter. Place a tortilla, buttered side down, on hot pan or griddle. Spoon 1/3 cup quinoa mixture over the tortilla; sprinkle with 1/3 cup of Monterey Jack cheese. Top with a second tortilla, buttered side up. Cook until the tortilla is golden on the first side. Carefully flip the quesadilla to the other side. Continue cooking until the second side is golden and the cheese is melted. Repeat with the remaining tortillas and fillings. I didn't add any salt or black pepper since the quinoa was seasoned, and the rest of the ingredients were full of flavor. It looks so good! 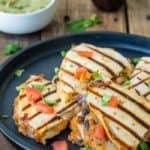 I love the idea of making quesadillas on the griddle instead of just a pan! Que delicia, ya mismo tendré que seguir tu receta. Aww Manali… you made my day!!! ♥ Quesadillas are super difficult to photograph for me too. I tried many angles before I found a good one. I guess the trick is keep practicing ☺Thanks for stopping by!! 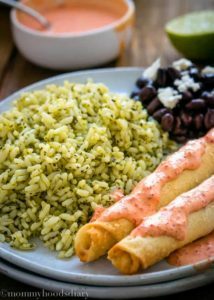 Todas tus recetas me encantan, se ven y quedan deliciosas! Gracias por compartirlas! Abrazos! 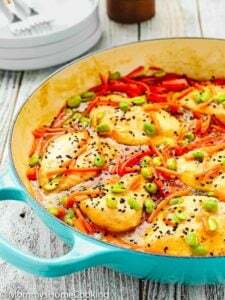 This recipe looks soo good! and can’t go wrong with some extra cheese! Healthy and indulgent, yum! Perfectly crisp and amazingly cheesy? I’m in!! 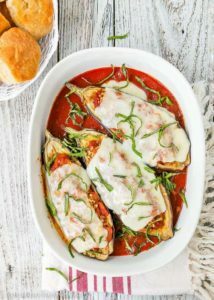 My family will love these and your special sauce sounds divine!